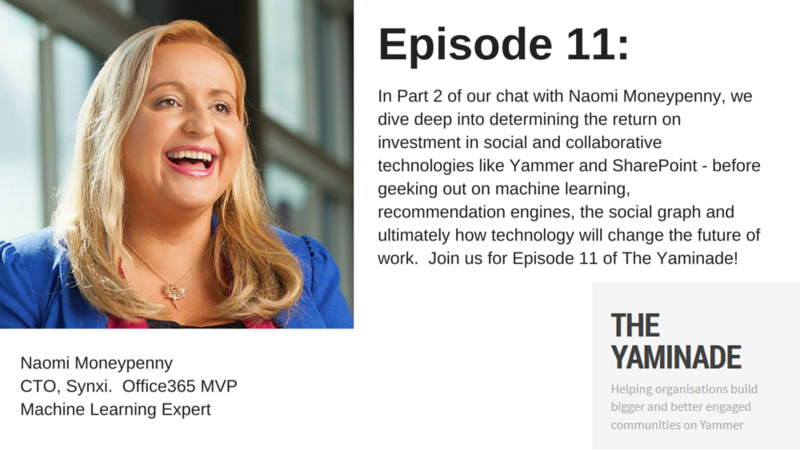 In Episode 10 of The Yaminade we kicked of a great discussion with Naomi Moneypenny (@nmoneypenny). After hearing Naomi’s interesting back story – including how she created one of the first Intranets in Europe – we dove into how ManyWorlds Inc (and Synxi) use Yammer to deliver innovative research and products to customers with a team distributed right across the world. By the way – if you love using the Stitcher app on your iPhone or Android device – you will be very happy to know that you can now listen to all past and future episodes of The Yaminade from your favourite podcast app. Make sure you subscribe via Stitcher today! Very interesting discussion. We are looking at change management using yammer and this has provided some useful tips.